gPage is easy to use. Choose an object among those available (text, line, rectangle, etc. ), place it on the page and modify it afterward. Each object has it's own context menu showing all possible modifications for it: no need to delve into the menu system to find out what you can do. You can modify any object without affecting any other, making edition a breeze. Print or export your work to file in JPG, PNG or WMF format. JustCad is configurate, to make cad drawing as simple as possible even for a beginer. 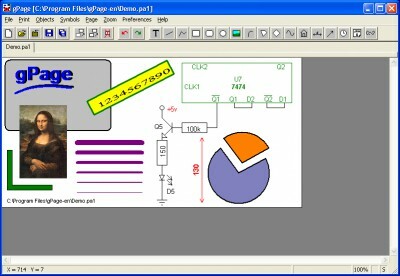 Schematic is a useful and reliable diagramming tool which allows complex schematic diagrams to be drawn with ease. Absolutely the best and easiest to use feet and inches (Architectural) calculator. Diagram Studio represents a powerful application designed to create professional-looking business, technical drawings and illustrations for your documents quickly and easily. PhotoOne Print is an advanced digital photo printing software for everyone. E-XD++ MFC Library is an MFC extension library that allows you to create the most advanced user interface in the world. Avax Vector ActiveX helps you to view, create, edit, print, and manage 2D vector drawings. CeledyDraw 2 is Powerful, Easy-to-Use and Affordable 2-in-1 Graphic Design and Desktop Publishing Software that anybody can use to create attractive, professional looking works in minutes.